Over the course of this series, we have delved deep into the realms of football fan culture to discover that there is a whole world of ultras to be enjoyed. However, we’ve arguably saved the best for last as we take a trip to the Turkish capital for this final chapter in the series. There are dozens of noteworthy fan groups out there, with contrasting ideologies, and supporters could argue for hours to decide who the best are. When it comes to discussions about the most fearsome, though, most would come to the same conclusion – Galatasaray’s world famous UltrAslan group. As their banner so famously declared: ‘Welcome to Hell’. Quality on the pitch may be debatable, but the fan culture in Turkey is universally accepted as one of the most passionate, and Istanbul is a hub for football activity. The spectacular city covers two continents and that divide between Asia and Europe is arguably best served by the infamous Kıtalar Arası (Intercontinental Derby) rivalry between Galatasaray and Fenerbahçe. 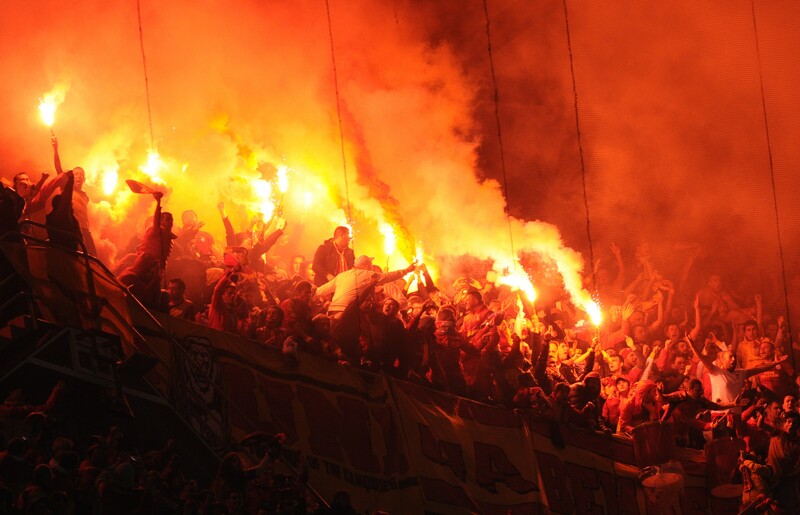 Galatasaray and its UltrAslan occupy the European territory. Historically speaking, they additionally represent the wealthier side of a poverty-stricken city. However, you wouldn’t know that in recent times as it is Fenerbahçe who boast the financial superiority thanks to a buyout, combined with poor management by the Gala boardroom. In fact, it was only just over a decade ago that the Galatasaray fans bailed out the club with a £3 million donation. How is that even possible if 80 percent of Istanbul’s population are below the poverty line? The answer to that is simple: UltrAslan has become a massive brand. UltrAslan memorabilia is extremely popular with the Galatasaray fans, even more so than the club’s official kits. 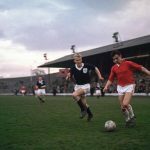 This became a big business, but their love of their team is so vast that they surrendered those assets to ensure the club would not dissolve – you can’t get a purer indication of passion than that. For many Turkish supporters, the terraces provide the only place where they can really make their voices know and the Gala fans certainly aren’t shy about showing it in the stadium, which regularly becomes one of the hottest cauldrons in world football. Galatasaray have occupied seven different stadiums during their 110-year history but their fans have always generated a cracking atmosphere regardless of where they play. Since 2011, the UltrAslan have ensured that visiting the Türk Telekom Arena is one of the most intimidating for away fans and players alike. In fact, shortly after their new 58,000 capacity stadium opened, the Galatasaray fans generated the loudest noise ever recorded at any sporting event. However that energy is something that accompanied the UltrAslan long before they entered their new stadium and they’ve provided a number of European football’s most memorable atmospheres – not least when they welcomed Manchester United “to hell” way back in 1993. The likes of Gary Neville and Ryan Giggs have openly admitted to Galatasaray being the most intimidating atmosphere of their careers and that is the exact desired effect that the ultras aim to achieve. The club means everything to these fanatics and they’ll do anything to help spur their boys on to victory. There is one fixture, though, where winning is more important than anything. And that’s the Kıtalar Arası derby. Istanbul is a city which consumes two continents and that provides the intercontinental derby with a truly unique aura. The fact these are also Turkey’s most successful clubs only adds further intensity to the battle. The rivalry isn’t simply a matter of on-field dominance; it signifies an almost tribal war between the two halves of the city and is a contest steeped in cultural significance. Ultimately it generates one of the fiercest but most exciting derbies in the entirety of world football. Turkey, and especially Istanbul, is a fantastic location but the combination of financial hardship and cultural ideologies presents a number of problems. One of the main issues in the area is violence and, in particular, knife crime. This is something that troubles the entire city, not just football, but naturally the pandemic does hang over this derby. The passion of these supporters is frighteningly intense and the hatred for the opposition is huge in both camps. This often manifests itself in violent incidents, both on the terraces and in the streets. Whilst an air of mutual loathing has always surrounded the fixture, the infamously symbolic Graeme Souness flag plant in 1996 increased the heat between the two clubs. Subsequently, several meetings since then have descended into total anarchy. 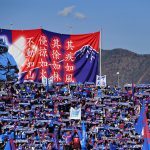 Stones, flares, broken chairs; the fans of both sides will happily convert anything into a weapon when it comes to the derby – violence has disrupted on-field proceedings on several occasions in recent years. Deep down, though, this rivalry is rooted by the love of their respective clubs and each set of supporters would gladly confirm that their feelings of adulation towards their team outweigh the hatred of their rivals. Nevertheless, you certainly wouldn’t want to push the UltrAslan too far. Once they feel aggrieved, this firm can turn very nasty, very fast. Everybody knows the tragic details of 5 April 2000, when two Leeds fans were murdered in Istanbul. Whilst the Galatasaray fans would admit things got out of hand, they maintain that the hostility emanated as a result of gestures of huge disrespect by the visiting Leeds fans. Either way, it is a truly horrendous episode in which two innocent people lost their lives. The one take away from the sorry incident is that this is a proud set of people whose entire lifestyle is built on morals, tradition, and respect. Ideological views are more important than life itself; for the UltrAslan, Galatasaray is a focal point of their existence. Back to matters on the pitch, Galatasaray went on to win the UEFA Cup that season and remain the only Turkish club to claim European silverware. That serves as a huge honour for the fans and provides a major bragging right over the likes of Fenerbahçe and Beşiktaş. The UltrAslan’s firmly believe that their team is the Turkey and look to mirror that by being the most vocal and intimidating in the stands. On occasions the violence does sour proceedings, but that is a by-product of boasting such a notoriously fearsome firm. Generally speaking, you cannot help but admire the atmosphere and electricity that these die-hard supporters create. There are few better sights in world football than the Türk Telekom Arena set ablaze by a sea of red flares as a game of chant tennis ensues between opposite ends of the stadium. For a long time now, Galatasaray’s ultras have been regarded as some of the most fanatical on the planet and they merit their place amongst Europe’s elite supporter groups. The occasional acts of hooliganism will forever remain as UltrAslan’s lasting impression on the world but upon closer inspection, it is their love of the club that shines through. The UltrAslan Ultras have arguably gone to more extreme lengths than any other fan group in the quest to help their club succeed. For that reason alone, they must be regarded as one of the world’s greatest.